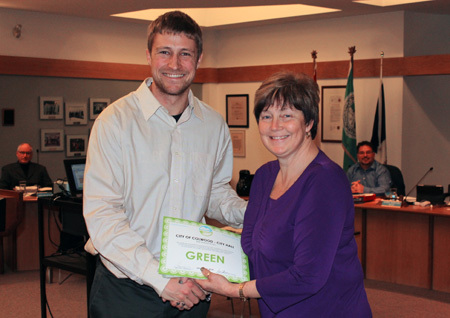 COLWOOD, BC – Colwood City Hall is the first office on Vancouver Island to earn GREEN certification by the Vancouver Island Green Business Certification (VIGBC) program. The City participated in a pilot project that undertook a comprehensive assessment of the City Hall building, operations and purchasing practices as well as employees’ environmental and social responsibility. When VIGBC staff completed the site assessment, Colwood became the first office on Vancouver Island to earn top honours for completing 29 actions to reduce its environmental impact. The certificate will be presented at the next Colwood Council meeting on Monday, January 13, 2014. On December 12th, assessors took a close look at things like lighting, efficiency of equipment, support for alternative transportation, cleaning products, recycling and composting practices, water consumption, work environment, and even how employees give back to the community. The City began the process with high marks due to existing business and environmental practices like light sensors, thermostat regulators, putting computers to sleep, recycling and composting. City staff were quickly able to improve their rating from Silver to Gold and then surpass the points required for Green certification by making a few adjustments. The City made some simple changes like upgrading several water faucets and arranging bulk purchase of certain products. But there were also some bigger changes that will have a lasting positive impact, such as switching to an innovative new courier service called GeaZone Eco Courier. GeaZone is an emissions-free delivery service that uses electric vehicles and human powered tricycles. Learn more about Vancouver Island Green Business Certification at: www.vigbc.ca. Follow us on Twitter @CityofColwood and Facebook CityofColwood.